Good morning! Welcome to The Morning Shift, your roundup of the auto news you crave, all in one place every weekday morning. Here are the important stories you need to know, or at least the ones that are fun to read if you want an inside look into the big ego auto industry. Mark Fields’ abrupt removal from Ford should come as something of a warning to other traditional automakers, especially ones whose shareholders demand answers as to why they aren’t valued as highly as Tesla: profits aren’t enough anymore. Record sales aren’t enough anymore. Making the goddamn F-150, which will always sell in huge volumes even in the event of the apocalypse, somehow isn’t enough. 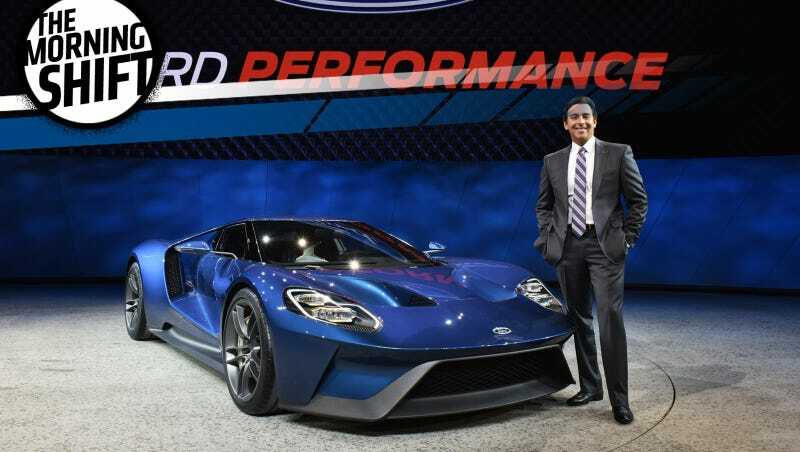 Under Mark Fields, Ford Motor Co. earned $10.8 billion in pretax profits in 2015. It earned $10.4 billion in 2016. And it projects $9 billion pretax this year. That’s north of $30 billion in three years. And it’s not good enough anymore. [...] The basic products that automakers sell, the way customers use them, the way they’re built and sold, and the field of competitors all appear headed for fundamental change. That’s why winning at the existing business model didn’t convince Wall Street — and apparently the Ford board — that the company is heading in the right direction. At today’s press conference, Executive Chairman Bill Ford stressed the need for a less hierarchical, faster moving culture. He touted Hackett as a transformational leader. Though Hackett is former CEO of an old-line Midwestern corporation, he has been a change agent, Bill Ford said. Perhaps crucially, he said that in a Silicon Valley visit, he saw Hackett — who headed Ford’s mobility unit — warmly welcomed by the tech elite. You have to please the tech elite! At the end of the day Fields brought in the profits but stock was down 35 percent, and that’s not going to fly anywhere. But what can Ford do to please the analysts? Turn into an all-electric ride-sharing company overnight? That’s clearly not going to work. The new guy, Jim Hackett, definitely has his work cut out for him. Research and development spending by seven major Japanese carmakers is expected to total a record 2.85 trillion yen ($25.5 billion) in fiscal 2017 as they scramble for advantage in such technologies as autonomous driving. By comparison, VW spent $15.2 billion in 2016 on R&D and GM laid out $8.1 billion. Inventing the future isn’t cheap. Their absence wasn’t a huge surprise when the show’s organizer, the Japan Automobile Manufacturers Association, announced the official roster Monday. This is so spectacularly lame. Chinese regulators have given their final approval for the new JAC-Volkswagen joint venture that will make affordable electric cars for the Chinese market. The joint venture contract has a duration of 25 years and planned annual output is 100,000 units. This is particularly interesting as VW has taken a stab at China’s EV market before with its own e-Golf and flubbed it. Seeing the company redouble its efforts in a difficult market is great to see, particularly as a contrast to, say, GM pulling out of India. The new appointments come as Audi VW Korea is gearing up to resume domestic sales. It has applied for recertification of three Audi models—S3, RS7 and A8L—at the Environment Ministry, and is awaiting approval. The local unit is also considering introducing the latest model of popular Tiguan SUV in the market. In August, the ministry revoked certification and halted sales of 32 models of Audi, VW and Bentley vehicles, in addition to imposing hefty fines for manipulating emissions and noise level test results, to win sales approval. I wonder what we would think of Audi here in America if they only sold those three cars instead of attacking our roads with giant SUVs. Neutral: What Is Mobility And How Do You Make Money Off Of It? Evidently selling cars at a higher price than it cost to build them isn’t what it takes anymore. So what’s the name of the game now?